A liverpool Vs Manchester United derby has always created an interesting game and this game was just that. Liverpool however dominated the game for long periods creating more chances than Manchester United throughout. Both teams had chances but it was Liverpool that had more. Young Raheem Sterling is a shining light in the liverpool side, full of confidence wanting to run at players and combining with Suarez well. This happened a few times in the first half as he caused Evra Problems. Suarez’s movement is always a handful as he checks short and peels into space behind defenders always looking to make runs in behind from passes from wide or from Gerrard. He is an intelligent player that creates so much with his movement creating space for himself or others. It was a bad mistake by JonJo Shelvey to lunge in on Jonny Evans as he had a ‘rush of blood to the head’. Yes the ball was there to be one but he didn’t need to lunge in but he merely just needed to stay on his feet. Yes both went with both feet but Shelvey’s dramatic lunge got him sent off. Right decision! Liverpool goal was a piece of great overlapping movement from Johnson and Suso but also Bad defending from Manchester United. Johnson and Suso worked it well down the left and play a ball into the box. To get the cross in Scholes made it very easy for Suso by diving in (typical Scholes challenge). 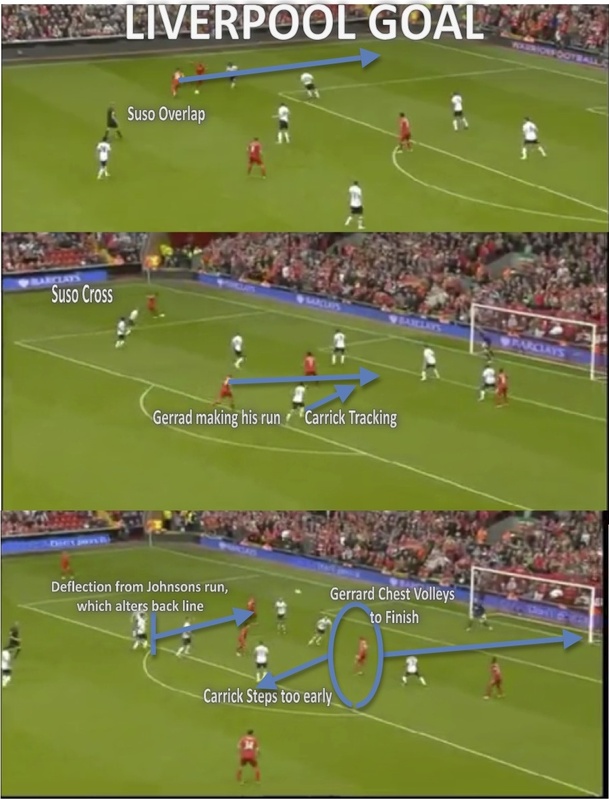 As Suso was driving at Scholes, Gerrard was driving into the box with Carrick Tracking his run. 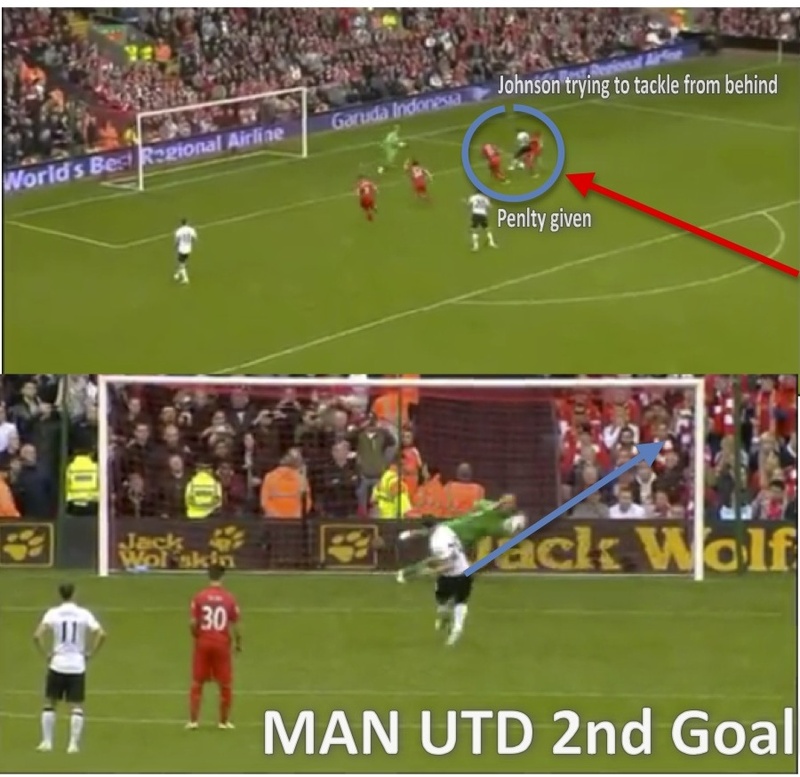 The ball was deflected into the box into Gerrard after Johnson’s run. As this was happening Carrick pushes up and leaves Gerrard with to much space and time to finish. Carrick went to early and should have denied Gerrad the space. Because he pushes up he is now the wrong side and consequently watches Gerrard chest and volley into the bottom right hand corner. Just before the goal Scholes came on for United. His Defensively ability is his weakness but his passing and his ability to dictate the play is his major strong point. Scholes gets on the ball and starts to distribute. He plays it wide to Rafael who runs into the attacking third. Sisou makes it easy for him to cut inside and draw a defender. Sisou should have stood his ground and made it difficult for him to penetrate. Rafael immediately gets pressed and plays to Valencia who delivers a great ball in. 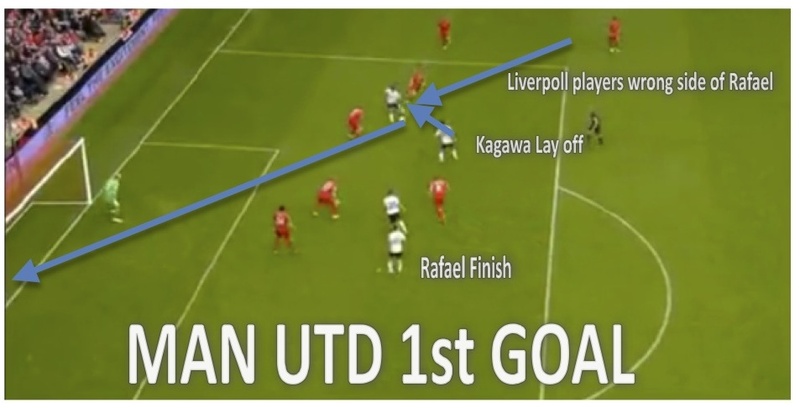 As Rafael plays wide he does not get tracked and is allowed to run into the box and receive the knock down by Kagawa. Rafael’s finish was excellent and was a shock to Liverpool’s GK Reina. The goal was caused by Liverpool giving the ball away in a dangerous area in the field with a sloppy square ball across the pitch. The weight and accuracy of the pass wasn’t good enough and was intercepted by the speedy Valencia. This allowed Valencia lots of space to break into on the counter and hurt Liverpool with a number’s up (3v2) situation. The desperate Johnson who was in the collision when Valencia stole the ball came in a tried to make a challenge from behind. Valenci went down pretty easy and the Referee pointed to the spot. Johnson didn’t need to make the challenge as it seemed valencia had ran out of ideas and space but it was too late for Johnson. Robin Van Persie consequently stepped up to take the penalty and scored. 10 men Liverpool still created chances and pushed for an equalizer but it was to be. 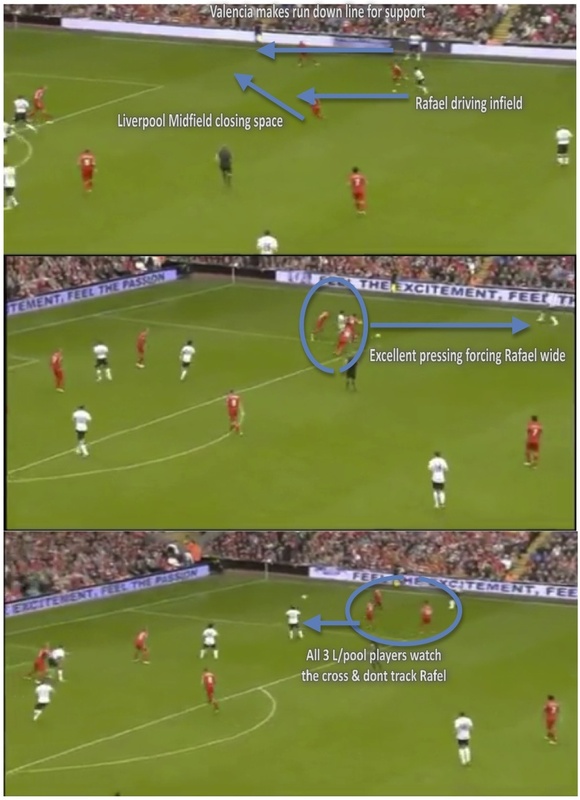 Rogers is yet to spark liverpool with that cutting edge, as chances are created but they still lack the goals. With a 4-3-3 system it is clear Liverpool will always create chances and possibly dominate possession with the likes of Joe Allen providing the distribution (Stat 57 complete passes out of 65) however it seems the way Liverpool play it is Suarez that is the player producing the movement and assists rather than the finish. For me it shows they are crying out a ‘Natural’ goalscorer. It was typical UTD winning a game that really this time they didn’t deserve. However they have mastered the art of the counter attack and have been doing it for years in the Premier League. They score against the run of play with their pace and when Liverpool got sloppy they capitalized. Liverpool deserved more even with 10 men for long periods but Man UTD took all 3 points. 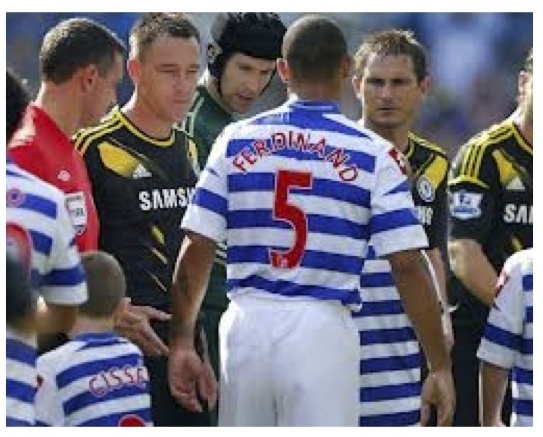 The QPR V Chelsea game had plenty of drama surrounding it due to the high profile case with John Terry and Anton Ferdinand race case. Once again the handshake didn’t happen and it is obvious it probably never will. The game was a close fought match with both teams having chances (chelsea had more). It is obvious that both teams defensively need work. Chelsea last season were giving away sloppy goals and this match it was evident that Chelsea can give goals away cheaply. QPR defensively in wide areas look shaky and Chelsea had joy down both flanks. The game was 0-0 but chances were created and not taken. Chelsea defensively switching off as a ball is crossed into the box. Mikel ball watching and not picking up runners into the box. Need to stay compact until ball is fully cleared or in good possession. 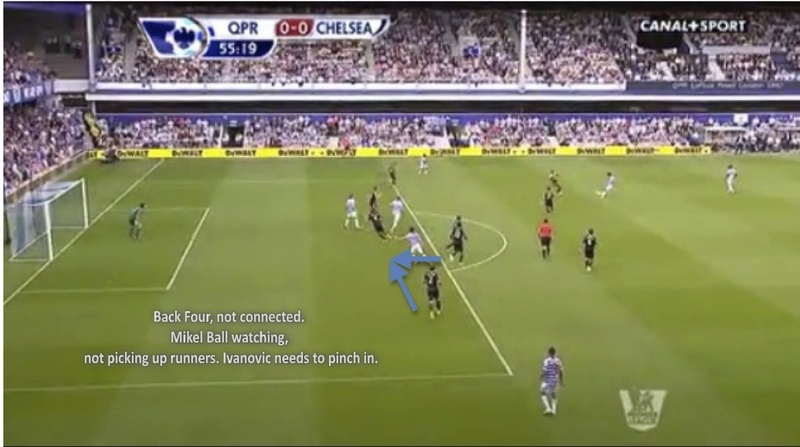 As you can see QPR’s left back is way too Tight allow ball to be played wide into space in behind. Possession was won marginally by QPR with 52.7% over Chelsea’s 47.3% however Chelsea made more passes in the final attacking third. Chelsea played more direct than normal as QPR pressed high up the pitch with their two forwards Johnson and Zamora. As usual Eden Hazard was shining light for chelsea as his sharp combination play in midfield caused QPR problems. Chelsea had a shout for penalty in the first half when Hazard was brought down on the left hand side of the box. 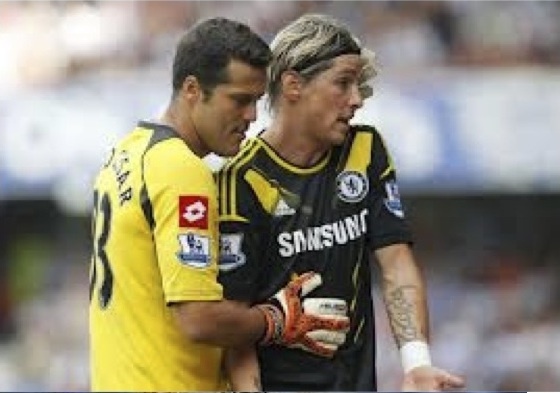 Cesar made some great saves from the better chances that Chelsea created mainly from Hazard and Torres. He kept QPR in the game. QPR had some half chances from a sloppy pass back from Mikel and a shot from Zamora outside the box. The game overall was pretty disappointing and was overshadowed by the hand shake drama. There was some exciting plays from Chelsea and some hard work from QPR. Overall Draw was a fair result.